Audio Recording on AllStar Link nodes. Reboot and the drive should be mounted. We can check that the USB is in fact mounted at the location /media/USB with the df command. From here we can play the files one by one in a player of choice, such as Audacity, or we can concatenate them into one or more files using SOX. Without our intervention, SOX will concatenate the files in the correct date and time order with the simplest command. Notice in the above that a new file “test.wav” now exists. Also note that the AllStarlink system uses a naming convention on the audio files using capital letters WAV. Audacity has the ability to further edit the file and change from wav to other codecs such as mpg. 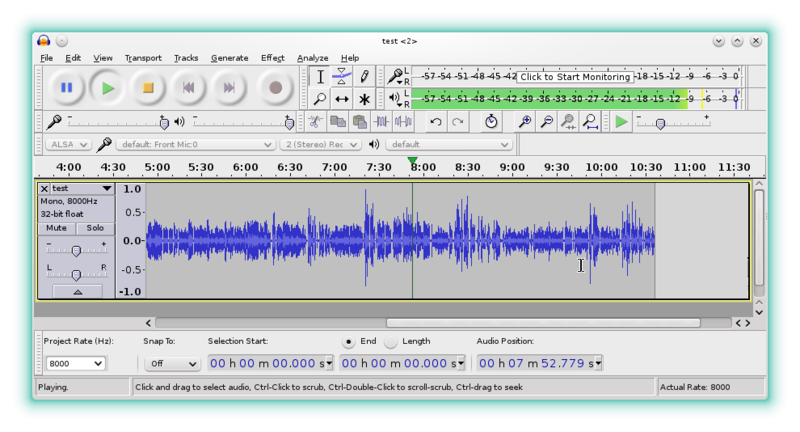 This screenshot shows the presentation of this audio file in Audacity. The file is linked above, if you would like to listen to it or work with it. This recording is quite useful in as much as one of the radios has an intermittent connection problem and one of the radios is over modulated. The picture in Audacity is worth a thousand words, and being able to listen to the audio more than once, makes it much easier to determine how things sound. If the radio is breaking squelch to often, the recordings of that will be plentiful. So if we plan to record, the squelch should be sufficient to silence the radio until a signal appears. This is a copy of the relevant post. If you have relevant information, please leave a comment about it. The modules have been added later. to be used with a pick-off enroute to an external dummy load or antenna. Unfortunately these are 30+ year old instruments which have usually seen a hard life. intensive labor to get one running has to be considered a lost cause at some point. be shorted, they are becoming notorious for this. and put on the internet. Operating the thing should be a pretty intuitive process. For generating a signal, use the CW position generally as that is locked to the TCXO. The FM Cal knob sets the frequency when the generator is in the modulated FM mode. OK, so after reading the above I setup to test the Service Monitor on the bench. I decided to use it in FM modulated mode to see how unstable that might be too. This video pretty much tells the story of how that worked out. Then using SDR# or HDSDR or whatever receiver you use on your local computer, configure the TCP interface for the server’s IP address and set the sample rate and other parameters as appropriate to start receiving from the RTL-DVB USB receiver served by the Raspberry Pi. Never wanting to reinvent the wheel and noting that this install provides many useful options, I followed the recipe there. For my archive I have copied the instruction set below. The configurations that bridge this PBX with my AllStar Link system will follow in the next post. To install Asterisk on a Rapsberry Pi with a Debian based system.